Hello A Jillian Vance Design fans!! Rosemary here on the AJVD blog today. With Father's day right around the corner I have a card to share today that would be perfect for the dad (or any guy) in your life. 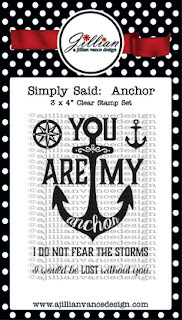 For my card I used the really cool Simply Said: Anchor stamp set. The layout and inspiration are based on the current Fusion challenge so I will be posting my card there, as well. The weathered paper you stamped the fabulous anchor on and the paper with the tiny anchors bring your handsome card together perfectly!! 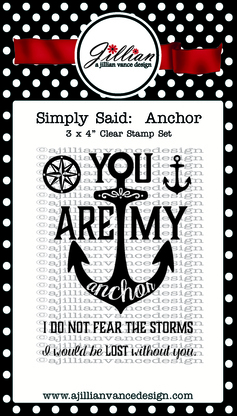 Wonderful stamps & papers perfectly put together, as always, Rosemary! 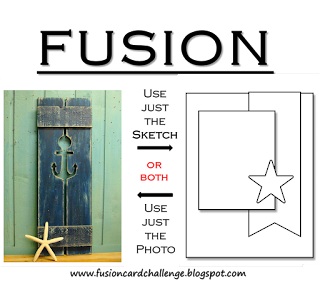 I really love how you paired your stamps and papers for this card...so pretty, and I love the nautical feel! Another really fabulous card, Rosemary!